Barbie on the beach? You’ll find her jogging on the pedi-path or sun bathing on the sand in front of the Hermosa Beach House in Hermosa Beach, CA. This quiet surfers’ beach is a quintessential California experience without the crowds, the chaos and the come-ons of Venice and Santa Monica. Easily one of LA’s best-kept secrets, the scene is made all the sweeter through the top-shelf, yet value-minded accommodations to be found at the Hermosa Beach House. The Beach House is one of the few hospitality properties in greater Los Angeles to sit right on the sand, and guests get to watch the Pacific Ocean from their private balcony, furnished with deck chairs. Because the Hermosa Beach House is also a condominium property, each guest room also comes with a gas fireplace, equipped kitchenette, pullout sofa, desk area/dining counter and large bathroom with deep-soaking oval tub. Have your coffee in room or in the breakfast room attached to the lobby. A comely continental buffet breakfast comes with the tariff, which starts at $219 per night. Another surprise is the spa. The Beach House has one – actually a spa room with on-call masseuses that can deliver a massage or facial within hours of the call. At no charge, the massage treatments can be administered in the guest’s room upon request. 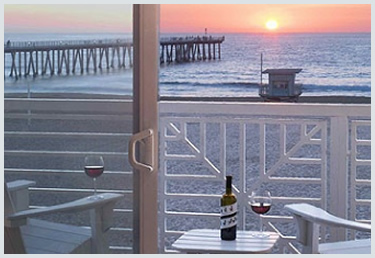 The Hermosa Beach House, as an example, offers 96 suites on the sand of the Pacific, just 20 minutes south of Santa Monica. The sand is clean, volleyball nets stand at the ready, and a 22-mile biking, jogging and walking strand running from Redondo Beach to Malibu is right outside the door. And the staff is ready to help with any request. For that special occasion take advantage of all the Hermosa Beach House has to offer. For an additional $95 to any guest room booking clients receive a bottle of Gloria Ferrer Brut Champagne, bubble bath, rose petals, complimentary valet parking and a late check out at 2:00 pm. The property is just a block away from the heart of Hermosa: a pedestrian mall flanked by bars, shops, restaurants and boutiques all leading to the pier. Along that pedestrian promenade sits The Lighthouse, a legend in these parts. Once a beacon of sound for the beat generation with the hot names in jazz at the time and Blues icons such as Mose Allison, today it still brings in the names and the classic folk and jazz entertainment in a cavernous room of hard wood floors and exposed aged brick walls. Also down the street is the Comedy & Magic Club where Jay Leno can be found on stage nearly every Sunday evening testing new material and engaging with audiences, who pay $30 for a reserved seat at the 7 pm stage show. Dinner menus are available but tickets need to be reserved early. (www.symfonee.com/comedymagic/home/Index.aspx). Finally, dining in Hermosa runs the range: from burgers and beer, to tapas and wines, to Italian and martinis, to Mexican, and Japanese. But the big recommendation here is Chef Alba’s Bistro (www.chefmelbasbistro.com). The small, unassuming cozy corner spot two blocks from the beach is the best place for steamers in Southern California, and where you want to have your Seafood Cioppino and not be overwhelmed by the broth. The restaurant delivers white-gloved service and finely paired wines by knowledgeable waiters, all put together by a serious chef who is passionate about her ingredients. This entry was posted in Hotels and Resorts and tagged Hermosa Beach House Hotel, Hotel in Malibu.